This week has mostly been about me being ill – not seriously ill, just an annoying cold with horrible flu-type symptoms; feverish, aching limbs, bad headache. Unfortunately I had to cancel our Poetry Society Stanza meeting at Trowbridge Town Hall and I was really sorry about that. I felt that I might be contagious so I didn’t want to inflict my germs on anybody, not to mention the fact that I felt wretched and crashed out in bed in the early evening. Anyway, I think I’m on the mend now but I’m several days behind with my planning for my workshop at Drawing Projects UK which is just under one week away. I should manage to organise everything in good time, however. Other things that have happened this week include good news for my daughter who at this moment has offers from all of the universities she applied to, for this October. There now follows a time of more studying so that she achieves the grades she needs. We’re all very happy for her. Our son takes his GCSEs in the summer, as well, so there is an air of purpose and scholarly application in our house. To help him along a bit, we’ve set up a desk in my writing room, a reception room that we used to call the playroom when we first moved here and the children were tiny. I’ve rather enjoyed entertaining a delightful companion in my working space although I’m not so sure about the music! I like his tastes in music (mostly) but I’m used to working in complete silence. I think I’ll manage as he’ll be back at school tomorrow and a little bit of Jimi Hendrix and The Beatles (some of those on his current playlist) at either end of the day won’t hurt me. Wishing everyone a good week, whatever you’re listening to. I empathise and envy. 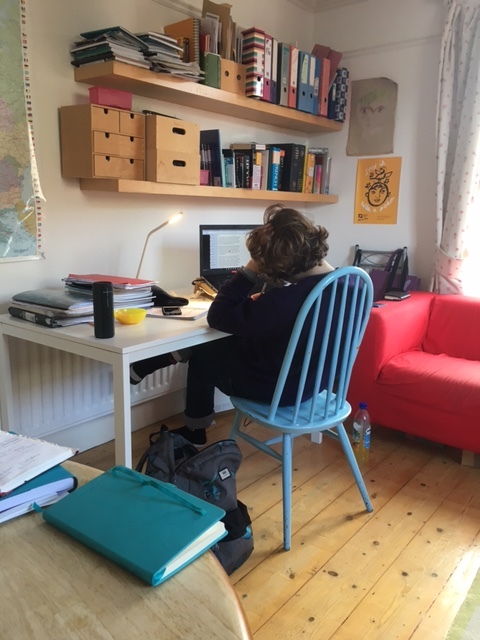 For the same reasons of looming GCSE mocks I’ve also been sharing a writing space with my daughter – alas I envy you the music choices – I’m plagued by Calvin Harris and David Guetta. Oh for Hendrix, Lennon and McCartney! Mine are younger, so I live in hope of a sudden onset of studiousness.